One of our favorite things about living in Citrus County is that there is an endless amount of things to see and do. There is always something happening right here in the Villages of Citrus Hills, and there are just as many fun attractions throughout the rest of the county. Tubing is popular and with the beautiful forecast for the next week it will be the kind of experience that your visitors will be sure to tell everyone back home about! Kayaking or canoeing is another way to see the beautiful Rainbow River if the tubing is not of interest. Located just a short drive from the Villages of Citrus Hills is Withlacoochee State Forest, the third largest forest in Florida. The Citrus Tract is 41,222 acres and provides a tremendous number of opportunities for Citrus Hills residents to get out and enjoy their wonderful natural environment. Like most state parks and forests, Withlacoochee State Forest has all the amenities that you would expect to find; camping, fishing, boating, and hiking. But in addition to those activities, there are also areas devoted to off-road motorcycle and ATV riding and horseback riding. Here are just a few of the highlights of Withlacoochee State Forest and Citrus County that make living here a great outdoor adventure! There are many camping locations throughout Withlacoochee State Forest. Some of the most popular areas are Holder Mine Recreation Area, Mutual Mine Recreation Area, and Tillis Hill Recreation Area. There are also many locations throughout the forest that are devoted to canoeing. The Withlacoochee South River, which flows directly through the forest, contains many points for canoes to enter or exit. Depending on the start and stop points, canoe enthusiasts can plan trips ranging from 3 miles all the way up to 14.4 miles. The Croom Motorcycle Area at Withlacoochee State Forest is a haven for dirt bike and ATV riders. This 2600-acre facility offers courses and trails for riders of all skill levels. There is also a training area for riders who are just getting their feet wet. More experienced riders will enjoy the rougher trails that have been left as natural as possible. The motorcycle park is open every day from 8:00 am to 5:00 pm. Riders who are looking to stay near the park for an extended period of time will be delighted to find that there is a campground here as well. 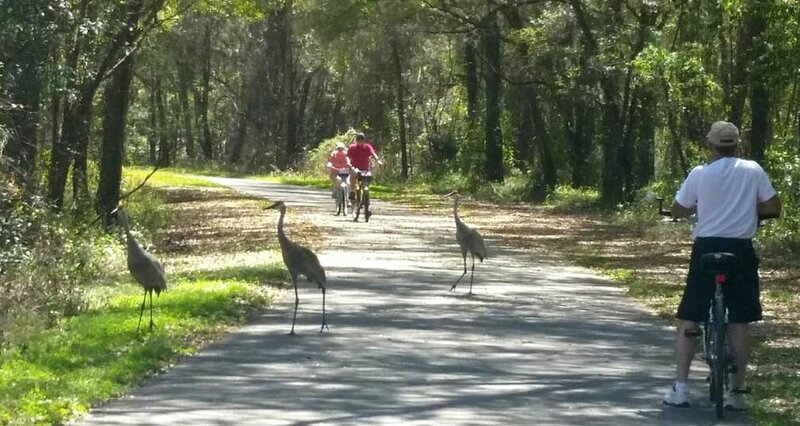 The Withlacoochee State Trail is currently the longest rail-trail in the state of Florida. The trail was originally part of Henry Plant’s railroad that ran from Croom to Inverness. Over the years, the rail line was part of the Atlantic Coast Line, the Seaboard Coast Line, and CSX Transportation. In 1989, CSX Transportation sold the line to the state of Florida so that it could be paved as part of their Rails to Trails program. The current trail runs from Citrus Springs down to within six miles of Dade City, for a total of 46 miles. The trail takes its visitors through everything from suburbs, to small towns, to historic landmarks. The trail is popular for walking, biking, and skating. It also has areas where horseback riding is available. There are many locations along the trail that feature a wide variety of dining and hotel accommodations. Withlacoochee State Forest contains two different horse trails that are featured in The Florida Trailtrotter Program. The Bear Head Hammock Horse Trail is 8.4 miles long, and the Little River Ranch Trail is 8 miles long. According to the Trailtrotter Program, one of the best ways to experience the natural beauty of the state parks and forests in Florida is on horseback. The Florida State Forest Trailwalker Program encourages Florida residents and visitors to experience the natural beauty of the state by exploring a number of different trails throughout each of the state forests. There are a total of nine different trails in Withlacoochee State Forest that are part of the Trailwalker Program. There are a number of shorter trails like Mud Spring, McKethan Lake, Hog Island, Johnson Pond, and Oxbow that are all less than 2 miles long. There are also some longer trails like Richloam South, which is 12.3 miles long! Whether you are looking for fast-paced dirt bike action, slow-paced canoe trails, or the experience of horseback riding through a natural environment, there are plenty of options available in Withlacoochee State Forest and along the Withlacoochee State Trail. Considering its close proximity to Citrus Hills, it’s easy to see why this is a very popular outdoor destination for our residents. One of the best things about living along Florida’s nature coast is that there are so many quiet little beachfront parks located up and down the coast along the Gulf of Mexico. Here at the Villages of Citrus Hills, we are within driving distance of quite a few excellent beaches, and Alfred A. McKethan Pine Island Park Beach is one of our favorites. Pine Island is located about an hour away from the Villages of Citrus Hills in the southern half of the Chassahowizka Wildlife Management Area. Getting there is a breeze if you take US-19 south from Homossassa and then a right in Weeki Wachee. Once you get close to the coast, you’ll make another right onto Pine Island Drive. From there, you will have the pleasure of cruising through a stunning natural habitat that feels like you’re driving across a Caribbean island or one of the Florida Keys. As in most of the beaches along the nature coast, you are going to find yourself surrounded by beautiful white sand once you arrive at Pine Island Park Beach. Enjoying a few hours lounging in the sand is a great way to start your visit, but if you are feeling adventurous, head on out into the water where there are plenty of great swimming areas. Because of its location, this isn’t the type of beach where you are going to be bothered by speedboats or jet skis flying past while you are trying to relax. Everything is calm out here, and that’s the way the people who visit like it. When you get hungry, there is a small cafe located right at the park that serves everything from burgers to seafood. They also have excellent coffee for their early morning guests. Because Willy’s offers open air seating that is pretty much right on the beach, this is a very popular option for patrons looking for a sunset view during dinner. If you have the opportunity to stay for dinner, we highly recommend it. In addition to Willy’s Cafe, there are also many picnic areas located throughout the park. So if you are looking to create your own amazing sunset dinner, you might want to think about picking up a few steaks and some charcoal on the way down. There are multiple charcoal grills available at each of the picnic areas. One other aspect that attracts visitors to the park is the large playground area for the kids. While the older visitors are definitely more impressed by the white sand beaches and gorgeous sunsets, the kids are all about diving headfirst down the slide. So when your grandkids are in to visit along with their parents, a day at the park out on Pine Island really does have something for everyone. With so many beachfront parks to choose from, it can take a resident here at the Villages of Citrus Hills years to explore them all. We encourage everyone to take their time and do exactly that, but after spending a day at Pine Island Beach Park, you might not want to go anywhere else next time.